Manchester City’s unlikely bid for a first UEFA Champions League title finally met its likely, rather inevitable end at the Estadio Santiago Bernabeu courtesy of an own goal by Fernando and a European masterclass, at least in seeing a game off by those who have done it the most: Real Madrid. The Blue Moon now returns to the Etihad Stadium where they face Arsenal, whom they haven’t beaten in five attempts, their most recent victory being a 6-3 thumping on 14th December, 2013 at home when Arsenal were “league leaders”. Surprisingly, the meeting between the two wouldn’t mean anything this time around as far as the Premier League title race is concerned, however, the race for finishing as runners-up is heating up, particularly between Arsenal and Tottenham Hotspur who are separated by just three points. 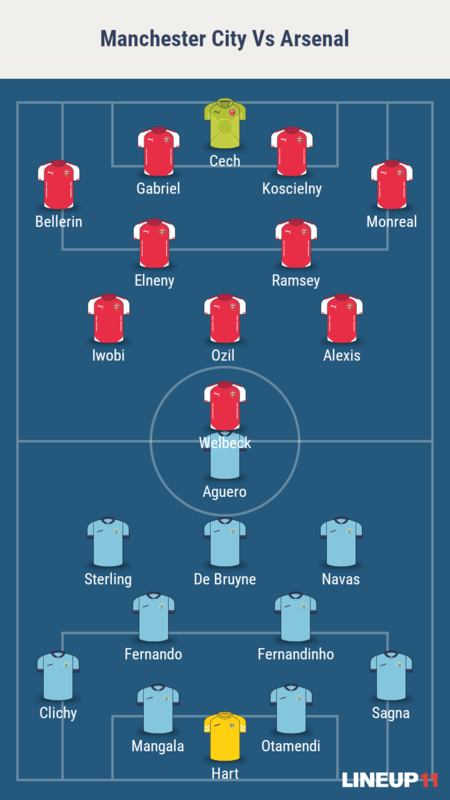 Arsenal may want to look to the 0-2 victory from the last season when they played a rare defensive game and didn’t let hosts Manchester City come anyway near them. A win at the Etihad stadium for the Gunners would do their hopes of a 20th consecutive St. Totteringham’s Day a world of good, any other result could potentially be the end to all those hopes. For Manchester City, this fixture holds a completely different significance. Currently fourth-placed, Manuel Pellegrini’s side are in danger of either missing out on a Champions League spot or having to play a tricky play-off in order to secure Champions League football next season, the failure to win which could mean that they drop to the Europa League. Two poor performances in a row, one a 4-0 mauling at the hands of Southampton and the other a reality check of the gulf of class separating them from Europe’s elite forces, wouldn’t help their confidence. But, they can derive a lot of confidence from the way Arsenal have played in their previous fixtures. Arsene Wenger’s side have lacked the attacking threat, haven’t been too good defensively and have struggled to show any hunger to perform in the closing matches of another wasted season. If there’s a time to beat Arsenal, then it is now, though, the same can be said about Manchester City themselves who have been nothing more than an embarrassment for a team that spends as much as they do. Looks like this one could be a potential belter. “It’s a special game because we finish here at home after three intensive years. We’ve always received support of the fans, so we’re really happy with them. “For me, the second season was the worst – if we can finish in third in this third season it wouldn’t be extraordinary but still a good season. “I will have emotions on Sunday but I prefer not to show them in an external way. “Sunday’s game is still important, even if Leicester are champions today and we are second best,” he said. “It is still a very important game because part of the responsibility of being professional is to prepare the future. The future of Arsenal Football Club depends on this game. “There’s a European Championship and there’s a Copa America [in the summer]. To get our players back, we made a schedule. It’s absolutely very difficult because the European Championship finishes on July 10. If you think that you have to give at least three to four weeks of holiday to the players who go to the end [of the tournament], that means they come back at the beginning of August. “Our target now is to secure a position in the Champions League next year. If possible, to get second place or at least secure third place. On Sunday we can achieve that. We still have two games, and if we win those two games we will be alright”.